Create a multitude of mini cards by using Hero Arts Long notecards. Stamp the owl onto pattern paper. Cut out. Stamp the owl onto white cardstock, color the branch and leaf, cut out. Punch a circle from cream cardstock. Affix the branch and owl to the circle. Punch 12-1/2″ circles from various pattern papers. Affix them to the back of the bigger circle. (Note: Use a button as the final circle). Cut a portion from a long notecard to create a mini card. Stamp the Heart Flourish with Soft Sand ink onto the mini card. 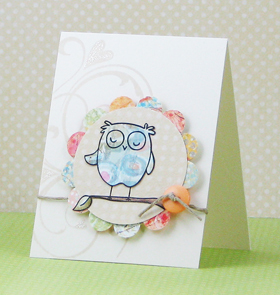 Mount the owl circle to the card with foam squares. Add string and button, secure with a knot. Use a black pen to draw in the legs of the owl.